Like many people I associate certain writers and artists with particular places: Hemingway with Spain, Toulouse-Lautrec with Paris, Dickens with London, Georgia O’Keeffe with New Mexico, and Paul Gauguin with Tahiti, and so on. If you mention Hawaii and the South Pacific, I might think of flower leis, milk white beaches, and James Michener. The ultimate goal for any writer or artist is to have his or her name linked with a particular place. And for me, and for many people, Michener’s name still conjures up the magic of the South Seas. I’ve often speculated why this is true. Perhaps it’s the dedication he showed to his craft, perhaps it’s the integrity that many readers associate with his name, or perhaps it’s the sound of the name itself, a name which sounds literary without being pretentious. He wrote about the South Pacific in his first novel, Tales of the South Pacific, and in a later works, Return to Paradise and Hawaii. Other writers have written more than Michener about the area; for some reason his name continues to be associated with the region. The South Pacific. It is an area that invites escape, a place where the soul luxuriates in its own peace, where people willingly surrender the modern world to encounter something much more elemental and rewarding in their lives. It is still the enduring symbol of paradise, a timeless spot that resides as much in reality as in our imaginations. When Tales of the South Pacific was published after the Second World War, many people did not know what to make of it. It was certainly an unusual book and treated war as something of an interruption in people’s lives rather than as a patriotic enterprise. It was one of first war books to deal with humor behind the lines. Before Tales, few if any war novels dealt with a buffoonish, rag tag band of anti- heroes as well as with the actions of brave men. The book, however, inspired an entire generation of television shows and novels featuring rebellious and frequently improper men in uniform—McHale’s Navy, F Troop, and Hogan’s Heroes, and Catch-22. 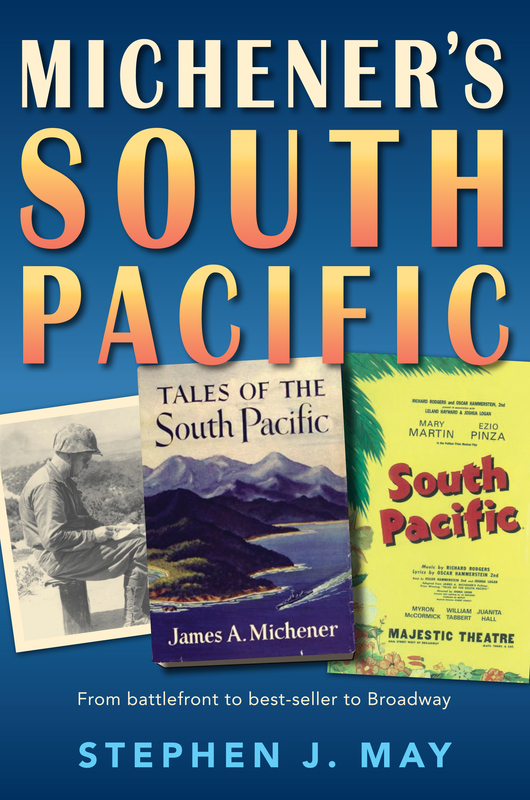 When Rodgers and Hammerstein adapted Tales for the stage in the form of South Pacific, Michener’s reputation reached a whole new level. Over the years, the musical went through several revivals until its present, lavish restaging by Lincoln Center Theater in New York. The themes of racial prejudice and intolerance continue to resonate. The novel was Michener’s first look at racial discrimination, but he continued to explore its themes in his subsequent novels. The issue fascinated and infuriated him throughout his life. This is one of the reasons why Michener still matters and why I attempted to capture these themes in my new book, Michener’s South Pacific. He wrote about many lands—the American West, Chesapeake Bay, South Africa, Poland, Spain, Israel, Afghanistan, to name a few, but his name will always be associated with the sunny isles of the South Pacific. I know this to be true–he wrote the book on it. Stephen J. May is also the author of Michener: A Writer’s Journey, which served as the basis for the PBS documentary James Michener: An Epic Life. He has also written a two-volume biography of Zane Grey and served as technical advisor for the most recent Broadway revival of South Pacific.